Bud & Joe's Tavern has been around a long time, since 1972. It's a name that will live forever in the minds of so many people that has visited, frequented or been carried out of Bud & Joe's. People remember drinking, writing on the wall, ceiling, a/c unit or whatever piece of real estate they can find to attach their name too. Everything has happened at least once at Bud & Joe's Tavern. We've seen people get drunk, fall down, get engaged, get married and get drunk again. It's a never ending cycle of fun and excitement! There's even a song written about the Bud & Joe's, and it's actually pretty good. You can listen to it here, just click the "SOUND" icon on the left side of the webpage just under the Hours. "Get Stranded At The Sandbar!" At the beach when you write it in sand it's like writing it in stone! This is the best drink special you will find at this beach... or any beach for that matter! Check it out and enjoy the ultimate Friday drink special. **This special is ONLY October Through March (Fall and Winter). Sorry! We have beer and drink specials everyday! So come by and visit any day of the week. 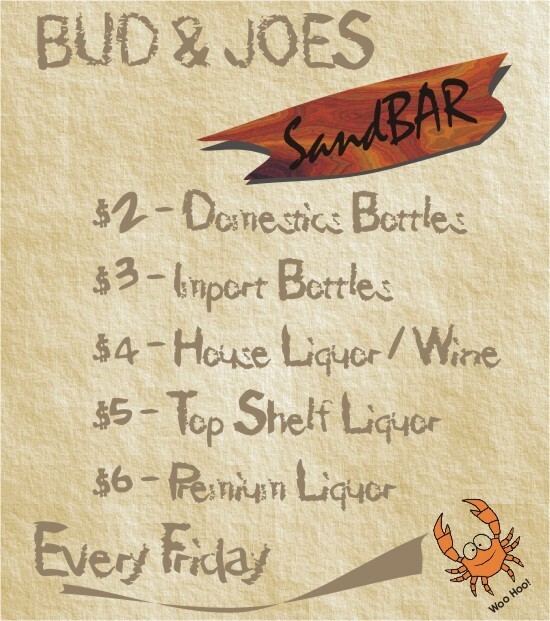 And remember, at Bud & Joe's SANDBAR, you'll never be treated like a stranger.